Last Friday I declared that we "apparently just purchased" Windbird, but that's not quite true. We had a signed conditional acceptance agreement with the owners and they delivered a signed bill of sale, but we still had a few boxes to tick before closing. We are financing a portion of the boat with our credit union (with interest rates a ridiculously low 2.46%, it makes sense to conserve cash for the refit), and before they'll cut a check they have a few things they need. Specifically: the survey, a conditional acceptance agreement, an insurance policy naming them as lienholders, and everything needed for transferring the USCG vessel documentation. I had already shopped for insurance during the last month. I got multiple quotes through IMIS, Bluewater Insurance, and a small private agent, and was surprised to see that rates and conditions varied quite widely. The most expensive policy, at $5500/year, also had a ridiculously high deductible. The one we selected, with Lloyds of London via Bluewater Insurance, came to $2200/year and has a $2400 deductible (10% for named tropical storms). This is an agreed-value policy and I was hoping to insure Windbird for $120k - her expected post-refit value - but they would only insure her for $85k for now. I'm hoping we'll be able to bump it up later based on refit receipts; if not, we may need to do another survey. The navigation limits are also somewhat restrictive, US coastal waters up to 150nm offshore plus the Bahamas. Our agent at Bluewater says we’ll be able to expand the navigation limits to include the Caribbean later on for around $700/year extra, but it doesn’t make sense to do so until we actually need it. We purchased our policy a few days ago but when the certificate came it didn’t have the endorsement naming our credit union as a lienholder. I just got the corrected one today. We decided a while ago to document our vessel with the Coast Guard rather than register it with a state, as this simplifies checking into foreign ports. 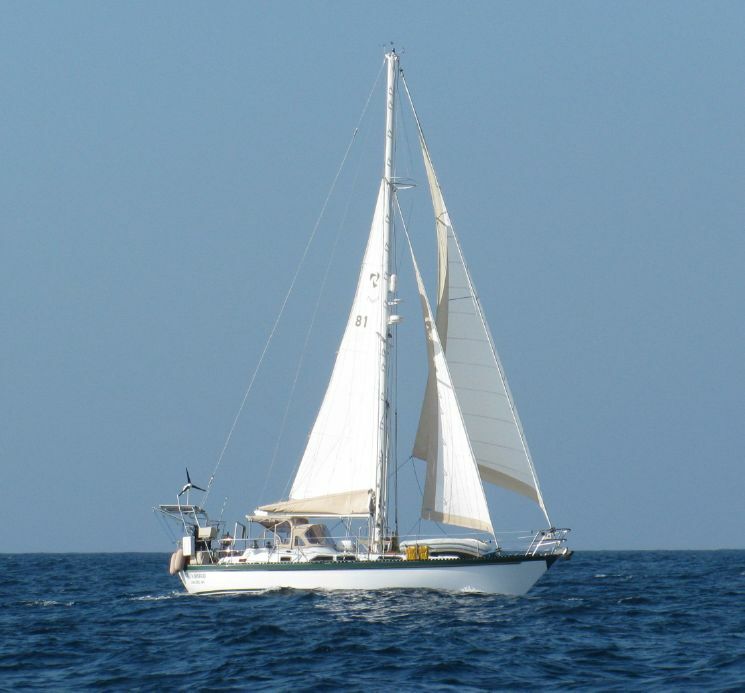 Windbird is already USCG documented which considerably simplifies the process; I was going to do the paperwork myself, but our credit union requires the use of Gloria Rector Vessel Documentation, which charges a hefty $500 for the service. One of the first steps was obtaining an abstract of title, which revealed that there was still a lien on the boat from the owners’ previous loan. They’ve paid off the loan, but the Satisfaction of Mortgage has not yet been registered with the USCG. Correcting that will involve getting a payoff confirmation letter from the owners’ previous lender as well as a signature from a bank officer, which may take a week or two. So closing is on hold until this is taken care of. Our conditional acceptance agreement included nine survey deficiencies we asked the owners to correct before closing. Work on these has been ongoing and is expected to be completed soon. In the meantime, I’m currently spending a week at the boat moving aboard, cleaning, inventorying, organizing, and starting in on my long list of boat projects. I was hoping to get off the dock for a night or two but that won’t be happening since we don’t own the boat, and I’m mostly doing putzy stuff that doesn’t involve a lot of money in parts or materials until the official closing. That still leaves plenty of work to fill our first days as (almost) boat owners. A few years ago Dawn and I visited Newport, Rhode Island, the self-declared sailing capitol of the world. Newport does have a rich sailing history going back to the whaling ships of early colonial times and continuing to the fast pleasure yachts of the ultra-rich from New York who maintained summer homes there. A number of these yachts famously competed for the longest-contested trophy in sports, the America’s Cup, in the waters of Narragansett Bay. The America’s Cup has moved on but Newport is still a hotbed of competitive sailing with many large regattas taking place here every year. In fact while Dawn and I visited Newport the Formula 18 National Championships were in town. We rented a little Rhodes 19 from the Sail Newport community sailing center at Fort Adams and managed to keep our tubby keelboat out of the way of the space-age, lightning-quick catamarans competing for hardware and glory. 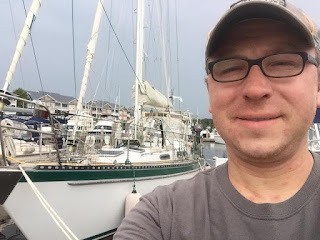 In a couple of hours of brisk sailing we made it as far south as Ragged Point and thoroughly explored the inner harbor; it was a really nice way to cruise the renowned waters of a really nice sailing town. For all that, though, I didn’t think there were really that many sailboats around, at least compared to other yachting centers around Long Island Sound. It wasn’t until a few weeks ago that I finally made it to Annapolis, Maryland, the other self-declared sailing capitol of the world. Annapolis doesn’t have quite the yacht racing pedigree of Newport or quite so long a seafaring history, but it does have the U.S. Naval Academy - and it does have a whole lot of sailboats! Everywhere you look, a forest of masts: in river mouths, in the yacht basin, on the bay, on land in busy boatyards, in store windows, on bar mantles, in restaurant paintings. Sailing simply permeates the culture of the entire town to a greater extent than I felt in Newport. Natural, then, that this is the home of the Annapolis School of Seamanship, an institution of nautical learning that is well known among cruising sailors. Among their offerings is a popular two-day marine diesel basics class; this is what brought me to town. Diesel engines in general and marine diesels in particular are a bit of a mystery to me. I’ve worked on my own small engines, motorcycles, and automobiles from a young age (though I confess I’ve started to leave more complex auto repairs to the pros as I’ve aged and become less destitute), so I’m reasonably sure that I’m not completely mechanically clueless, but diesels have different and often more complex fuel delivery systems and marine diesels have entirely different cooling and exhaust systems. With Windbird I’ll be diving straight into working on a popular Yanmar 53-horsepower 4-cylinder diesel (4JH4E) that’s not very old but has a lot of hours on it, and so I wanted some background knowledge before I started learning my specific engine. I signed up for the class well before Windbird’s survey was scheduled for the day prior, but convenient Delta flight connections through Atlanta made it possible to get to Annapolis by 10pm Friday night. Unfortunately puppy-care arrangements precluded Dawn from accompanying me. The class was really good; I learned a ton and think I’ll be a lot more confident learning to work on Windbird’s Yanmar now. The first day covered Diesel theory, operation and components; the second day involved hands-on maintenance and troubleshooting. The engines used were smaller and older than the 4JH4E but the instructor, professional mechanic Scott Siegel, said they’re nevertheless pretty similar. During lunch break and after hours I enjoyed exploring Annapolis, walking the docks & looking at boats, talking to other sailors, and sampling the local brews. The only bummer is that Dawn wasn’t able to come with, but we’ll both be back in Annapolis soon enough. The United States Sailboat Show is in early October, and immediately following is “Cruisers University,” a four-day marathon of sailing seminars covering topics of interest to cruisers, especially new cruisers like us. We’ll be going for the final two days of the show – it’s a great place to score killer deals on boat gear – and then all four days of Cruisers U. As we’ve planned our transition to our new sailing life it’s become apparent that there are two parallel preparations to take place: our boat, and ourselves. The boat prep will start very shortly – this weekend, in fact. But we’re already deep into our “knowledge upgrade plan,” and the learning process thus far has been really enjoyable for both of us. I feel a bit like the dog that caught the car right now. We've apparently just purchased a 42-foot classic fiberglass cruising boat filled with complex systems we have little experience in using or maintaining, and so last night when I really needed to get a full night's sleep in preparation for a long day of flying, I instead lay half-awake tossing and turning and dozing off into boat maintenance dreams/nightmares. At 3am I told myself this is silly, this is an exciting event and there is no need to be scared, I'll learn these new skills just like I've learned other complex skills throughout my life - and then I mostly tossed and turned with excitement for this next chapter of our lives. It was a long flight from Seattle to Atlanta today. Windbird's bottom survey was on Tuesday and this time the chosen yard had enough water in the well to get the boat up on the Travellift. Like the rest of the survey, this part was not perfect, but there was nothing so alarming as to make us walk away from the deal. I did some research on repair costs and the owners again proved flexible in negotiating a fair deal. We signed the conditional purchase agreement last night, Mark & Judy signed this morning, and now we're just waiting on the insurance, bank, and documentation transfer people to catch up. I have July 30th-August 5th off work and this will likely be when we'll make our first foray to Windbird to begin boat work. We're hoping to get off the dock and enjoy a night or two at anchor as well. In the meantime I have lots of call to make, to start work on the air conditioning, the canvas, and reconditioning the sails.... the refit list grows daily. 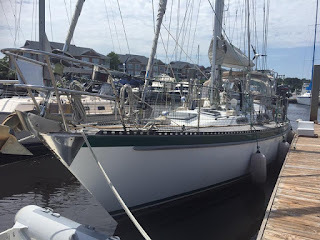 Judy recently wrote in her blog that much of the books and equipment that their friends pulled off Windbird has finally caught up to them in Falmouth, MA, and a good portion of it will be headed back down to Little River shortly. Between that and Dawn's carfull of boat boxes currently at the MYR airport, we'll soon be moving into our new home on the water. Dawn and I loaded her Jetta with boxes of things that are needed on the boat but not in the apartment on the night of July 4th and headed out of town at 7AM the next morning. We got about an hour away before realizing that we forgot our checkbook to pay the surveyor and the yard that would haul Windbird, and began to turn back before deciding we could just call our bank to up our daily limit and withdraw cash from an ATM. We drove for 14 hours and covered a full 1000 miles before stopping for the night in Knoxville, TN. We only had 7 hours to cover on Thursday and arrived in Myrtle Beach by 3pm. 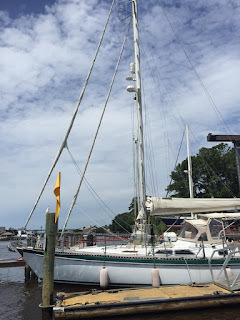 First order of business was securing an employee parking pass at the Myrtle Beach airport, and then we headed 20 miles north to Lightkeeper's Marina in Little River. The temperature was hot (95 degrees) and sticky, and forecast to be worse for the survey on Friday. Windbird's broker, John Schwab, had bought a portable air conditioner from another client and rigged it up in Windbird's salon, bringing the cabin temperature down to a bearable 85 degrees. Windbird has aircon but the compressor (or possibly the whole unit) needs replacing. I was going to buy John's portable unit as a temporary solution if it worked well but it was unfortunately about an inch too big to stow in Windbird's largest locker, so we're just going to have to put "fix/replace A/C" as item #1 on the refit list. The portable unit would be ok to make our first night on Windbird bearable though. John and his wife Beth stopped by Windbird shortly after we settled in, bringing a little cooler with beers in it for our first Windbird happy hour. We talked for a while and after they left, I set about pulling off the chainplate inspection panels in the cabin. Even with them off, you can't see where the chainplate penetrates the deck very well, but what I did see I didn't especially like. No worries, chainplate replacement was baked into our offer. For the rest of the evening we measured lockers and cubbies, inventoried the contents of the chart table, and buttoned up the boat when a nasty-looking storm blew through. After it passed we headed to "The Officer's Club" for a late dinner - had a fantastic half-rack of ribs special for $10. When we returned we stopped briefly at John and Beth's, and then retired for the night. I was expecting an early morning as the surveyor, Neil Haynes, was known as an early starter. I was thinking 8am. I slept well but awoke at 5:30am on Friday, July 7th, and was surprised with a knock on the hull at 7. John brought a thermos of coffee and informed me that the surveyor was already here. Whoa! I threw on a pair of shorts and emerged topsides to find Neil already hard at work. Smart guy, working while the day was still cool. He started with the on-deck survey and then moved down below. "You're making my Friday my Monday," he remarked. "There's a lot of equipment on this boat!" I stayed close to Neil throughout the day as he pointed out things that needed correcting or upgrading and occasionally asking questions. 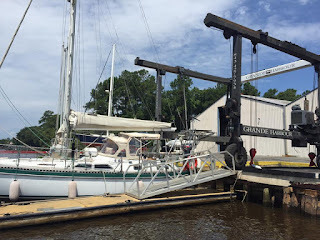 I shouldn't have been surprised given that Windbird is a 34 year old boat with a lot of miles under her keel, but there were a lot more things that needed addressing than I realized, some of them safety-critical. There weren't really any deal-breakers - just a lot of putzy stuff with a couple of bigger-ticket items thrown in. The hull and decks appeared sound, though, and Neil found no evidence of water intrusion or leaking into the cabin. "It needs work, but it's built well and it's certainly not a basketcase," was Neil's ultimate verdict. Neil and I were still below when John and Beth came aboard at 11am and started the engine to prepare for the short quarter-mile trip down the Intracoastal to Grande Harbour Marina. When we got there, it wasn't quite full high tide. We were able to get Windbird into the slipway, but then the TravelLift straps refused to go under her skeg and keel. We waited another half hour until slack high tide, and we still couldn't get Windbird on the lift. Finally we decided we had to get her out of the slipway before the falling tide stranded her for another 12 hours. It meant we wouldn't be able to do the bottom survey today, which was really disappointing. John has hauled deeper-draft boats than Windbird (5'9") there before, so they think the slipway has recently silted in and needs to be dredged. On our way back to Lightkeepers we put up the sails and did a few other things for the sea trial. Back at the dock, Neil finished up his work and we made a quick call to the current owners to ask a couple questions. Neil said we could expect his report by the following Thursday. Unfortunately his schedule was booked solid for the next month, meaning we'd have to find another surveyor to do the bottom portion as well as a yard with more water in their well. John said he would handle arrangements for both. Meanwhile I told him that the boat needs more work than I expected, and my acceptance would require the owners to repair some things and give a price adjustment for others. He said ok, make a proposal once you have the survey report and we'll go from there. Neil sent me the report this Thursday morning and I spent the afternoon writing a conditional acceptance offer, which I subsequently refined and sent on Friday. It basically asked that the owners repair nine safety-related items noted on the report before closing, that they give a price adjustment for five more expensive items, and that I remain responsible for correcting another sixteen items. John called last night to let me know that the owners accepted my proposal but were offering the dinghy and outboard in partial trade for the price adjustment (they weren't included in the listing or original offer, a dumb oversight on my part). Dawn and I approved their counter-proposal, so pending the bottom survey we have a deal. That will take place this Tuesday. Fingers crossed! Lots to catch up on over the last week or so, each of which merit their own posts, but I'll give you the cliff notes version here. On Tuesday we packed Dawn's car full of boat-stuff boxes bound for Windbird (assuming we end up buying her, otherwise they'd eventually find their way to whichever boat we buy), on Wednesday and Thursday Dawn and I drove her VW Jetta the 1400 miles from Minneapolis to Myrtle Beach, on Friday Windbird had her survey, on Friday night I flew up to BWI, over the weekend I attended a Marine Diesel Engines class at the Annapolis School of Seamanship, and then I finally flew back to Minneapolis tonight. Whew! I won't keep you in suspense, the survey wasn't perfect but there were no dealbreakers, just lots of little things and a couple bigger things that will require a little more negotiation once we get the official report, which is pretty standard. I learned a lot from the very knowledgeable and personable surveyor, Neil Haynes. Unfortunately, we weren't able to do the full survey. 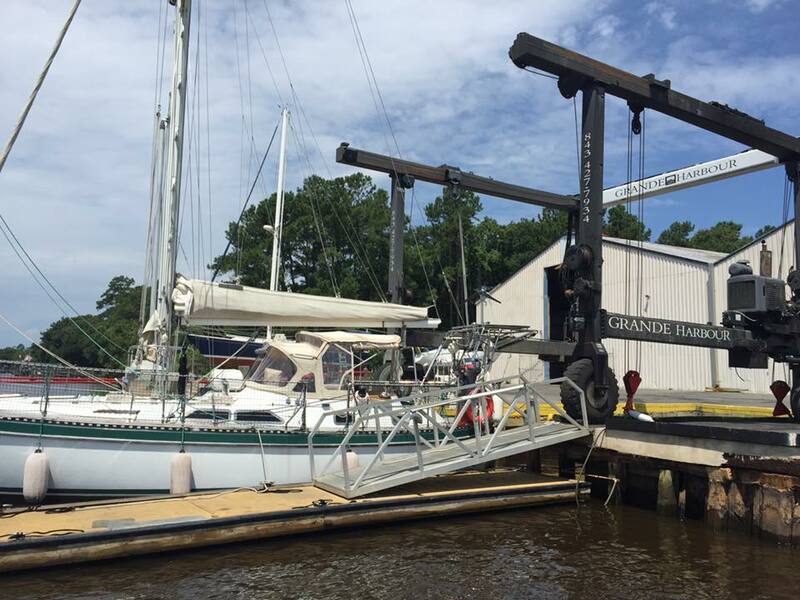 We had arranged to be short-hauled at Grande Harbor Marina in Little River SC, and showed up just prior to high tide, but there wasn't enough water to get the Travellift straps under Windbird's keel no matter how many times we tried. We think the slipway has silted in recently. So now there will be a delay while we try to get another surveyor to do the bottom survey (Neil is booked up for weeks) and haul Windbird at another yard further away from Little River. I've seen fairly recent pictures of Windbird on the hard and don't anticipate a problem; it's just the delay that's a bit frustrating. Oh well - as always with boats, patience and flexibility are the name of the game. I got home tonight to find that Piper's inflatable PFD has arrived! It's the first of its kind and is made by a small mom-n-pop operation called Critter's Inflatable. 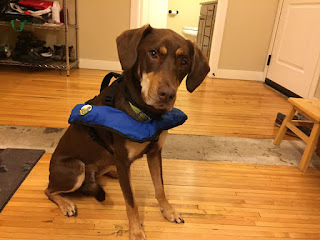 It appears to be a great design and very well made, and Piper didn't put up nearly as much of a fuss over wearing it as I thought he would (less than his walking harness, actually). Dawn and I haven't bought our own inflatable PFDs, or really any equipment yet, as we're waiting to inventory what's on or coming with Windbird first. One of the things about our cruising plans that's made me a bit worried is how well our dog Piper will adapt to life on a sailboat. He's still a pup at 20 months old and has a bit of a nervous disposition. In some ways he acts like an abused shelter dog, though we've had him since eight weeks old and have never hit him. There's not really any rhyme or reason to what sets him off. He's fine with thunderstorms and fireworks but bicycles absolutely terrify him. He was ok in our Pacer airplane but until fairly recently would quiver violently on car rides if the windows were up. He warms to some strangers immediately, barks fiercely at others, and cowers to others. Large crowds turn him into a quivering mess, except at the dog park where he acts like the mayor. He hates baths with a passion but is perfectly happy to splash around in a lake and is a really good swimmer. He's been on fishing boats and pontoons and seemed to enjoy himself, but that's a lot different than a heeling sailboat bashing upwind. I figured he'd eventually adapt, but worried that it might take a while and he'd be terrified in the meantime. 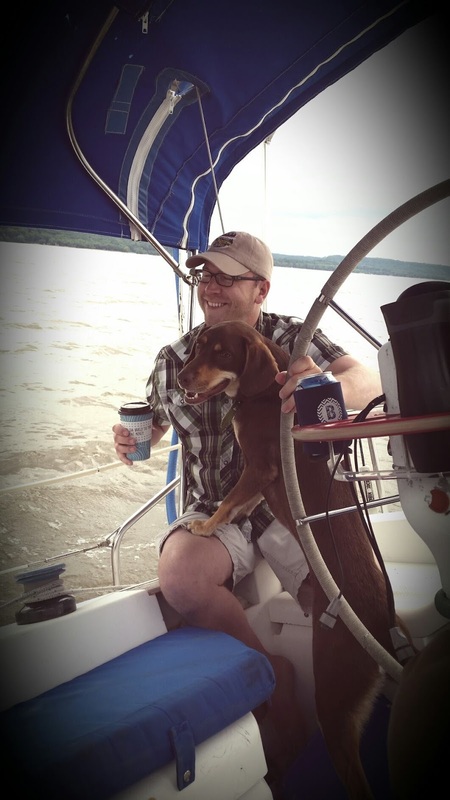 While Dawn was off sailing in Puget Sound last week, my friend Chris Warrington invited me down to Lake Pepin to sail on his Hunter 31, Simple Pleasures, and suggested I bring Piper along for a little acclimatization time. Our mutual friend Lance Yesdnil was in town for captain upgrade training at Compass Airlines and happened to have the day off, so I picked him up on my way out of town. I know Lance and Chris through a former coworker of mine, Andy Peterson; the three of them used to own a Bristol 29.9 based out of Puerto Rico for several years. They brought "Yolo" to the Interline Regatta in the BVI in 2013, and I helped crew on the overnight passage back to PR. Sadly, she was later dismasted near Culebra with Andy and his father on board; they were lucky to cut away the rig before the wreckage holed the hull, but subsequently sold the boat. 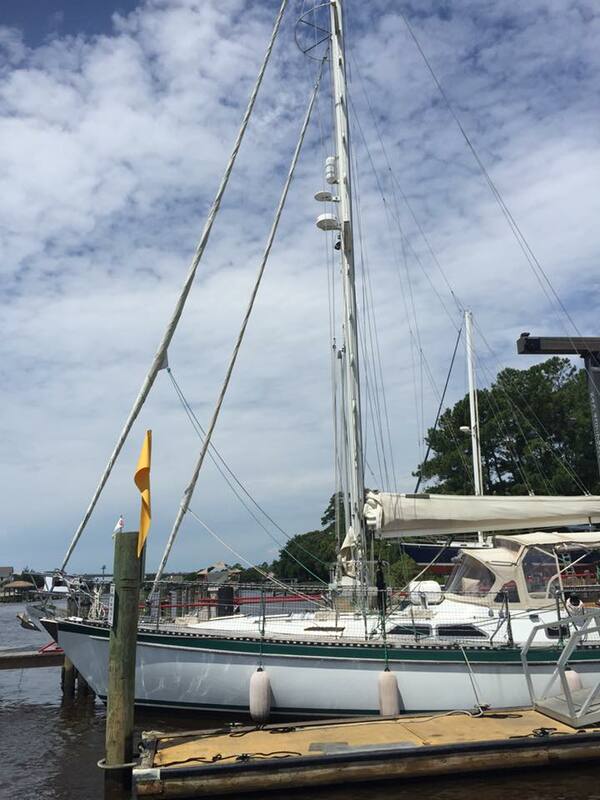 Chris already owned Simple Pleasures at the time; he had bought her on the Gulf coast as a cheap wreck in the wake of 2004's Hurricane Ivan, trucked her home, and fixed her up. She's been plying the waters of Lake Pepin (a wide dammed portion of the Mississippi River that forms the border between southeastern Minnesota and western Wisconsin) ever since. After arriving at Chris' lakeside home and taking the tour, we threw Piper into the aluminum tender, cruised out to Simple Pleasures' mooring, and hoisted Piper aboard. Immediately he set about checking out every square foot abovedecks. 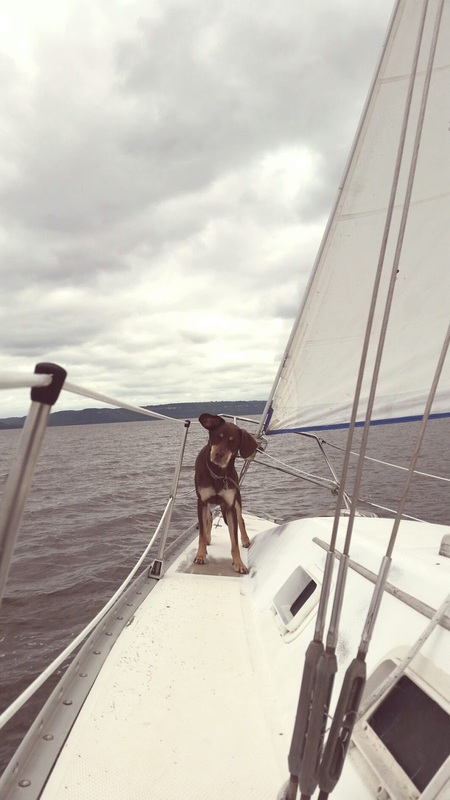 Even after we motored out into the chop, and even once we set sail, Piper continued moving around the boat quite a bit. He definitely has a tough time sitting still, especially in a new environment. That said, he never showed the least sign of jitters. As we tacked out to the east side of the lake, the wind picked up to 10-15 knots with occasional gusts up to about 18, and Piper didn't seem to mind the boat heeling and pitching through the waves in the least. I got a little concerned that he kept coming back to the cockpit via the low side...Simple Pleasures has lifelines and a toe rail, but it's definitely not as secure as going over the high side of the tall coach roof. At one point I saw a gust line coming across the water while we were close hauled and Piper was on the low side. I luffed up a bit but we still heeled and Piper momentarily lost his footing; I thought we might have a "dog overboard" situation. He caught himself on the toerail and regained his balance, and after that only went to and from the bow via the high side. Smart dog. We were out for a good five or six hours and Piper really seemed to enjoy it. He eventually settled down and didn't go back and forth on the boat as much, and instead found a secure spot to gaze out over the water. He didn't show any inclination to jump in, which is something he's done from a fishing boat before so that was a bit of a concern. He didn't care much to go down the companionway ladder, but we taught him how to climb up it and let him roam the salon and lay in the v-berth for a bit. Overall I thought it was a great introduction to sailing for him, and a bit of a load off my mind. Windbird has much more open deck space that I think Piper will enjoy roaming; the boat also has netting around the lifelines and stern rails, as the current owners have young grandkids who often visited aboard. I think the companionway ladder will be too tall and steep for Piper to negotiate on his own, but that's not necessarily a bad thing as I think we'll prefer to control his movements between deck and cabin. Getting in and out of the dinghy might be interesting. We are planning to get Piper an inflatable pet PFD, which will also serve as a harness to keep him clipped into the cockpit in rambunctious conditions. The one other thing that's on our mind is teaching him to go potty on a square of carpet lashed to the deck, for while on passage or when conditions don't make it feasible to land him ashore. All part of the adventure!